Last time we learned that strings in a specific language are grouped together in packages and packages are grouped together in package lists. Strings not only have text and a language, but they also have an associated font, font size and font style. To get to a specific string, you need three things: the package list handle (EFI_HII_HANDLE), the string identifier (EFI_STRING_ID) and the language. Since you are normally using the platform's current language, you generally don't have to worry about that and use the default setting. There are two sets of string-related protocols: (a) those which add, modify and remove strings from the HII Database and (b) those which create a bitmap using the strings text. With EFI_HII_STRING_PROTOCOL, you can create new strings, retrieve the string's text, change the string's text and find out which languages are supported. NewString() lets you create a new string within a specific package list and returns back a new string identifier. You can specify (if you want), the language and the font information. If you don't specify the language, the platform's current language is used. If you don't specify a font, then the platform's standard font is used. GetString() retrieves information about a specific string, including the string's text and the associated font. If you don't specify the language, the platform's current language is used. SetString() changes information about a specific string, including the string's text and (optionally), the string's font information. If you don't specify the language, the platform's current language is used. GetLanguages() reports the languages that are supported by a specific package list. GetSecondaryLanguages() reports the regional versions of a specific language supported by a specific package list. For example, if you passed in "en", it might return "en-US", "en-UK" "en-PH" if there were specific translations for those regional variations in English. StringToImage() draws a string's text onto a bitmap or the screen at a specific location. If the font is not specified, then the platform's standard font is used instead. If the language is not specified, then the platform's current language is used. This function also allows you to clip the text to a rectangle in a variety of ways, wrap the text, draw transparently and handle multi-line text. Even more useful to sophisticated users, it also reports the positioning of each character in the string in the bitmap so that user-interface code can use it for cursor movement and mouse selection. StringIdToImage() does the same thing, except that you pass in a string identifier and a package list handle. Next time we'll start looking into the wonderful world of bitmapped fonts. I just saw that they posted publicly the information from Intel's IDF, including the UEFI track, here. You can see a number of interesting articles from the industry heavyweights, like Dell, IBM, Microsoft and Intel. 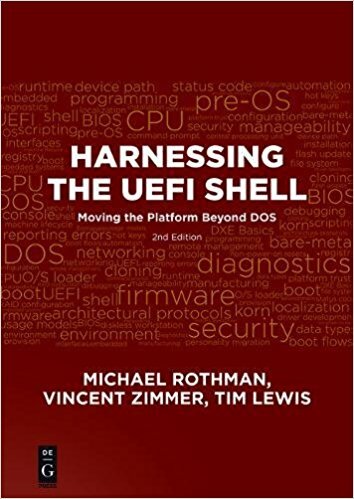 Not to mention the co-authors of a book (Vincent Zimmer, Mike Rothman) about the UEFI Shell. Good reading. How do you create the packages and package lists? How does the driver find them? Built-Into The Driver. In this method, a tool takes the bytes that make up the package list and generates an assembly-language (.ASM) source file, which is then linked together with the rest of the driver. This method makes it easy to find the package list, since it has a normal label that resolves during the linking process. Separate File. With this method, the binary is packaged up as a normal firmware file with a special file type or, more commonly, a special file name. The driver then searches the firmware volume in which it resides for a file with the special name, loads it into memory and then gets a pointer to the first byte. This method takes a little more work, but it allows the package list to be generated separately. Since the package list can be easily located, it can then be edited at some point after the driver has been compiled but before the final flash image is created. This is very useful when you want to process the package lists without ever touching the source code. For example, if your driver ships supporting 30 languages, but you only have ROM space for 3, you could either recompile the driver or you could just edit the binary information. Or perhaps you want to allow a downstream VAR to substitute their logo for the generic logo. By making the binary form of the package list easy to locate, these changes can be made easily. This method also allows files to be on separate media, such as a disk. Same File, Separate Section. This method is similar to the method described above, in that the binary information is packaged separately from the EXE. However, here, the binary is included as a separate section in the same file. The Firmware File Specification (either the older Intel Tiano version or the newer UEFI PI version) allows certain file types to be broken up into sections. One section contains the driver itself and, in this case, another section contains the package list. This shares many of the advantages of the previous method, but creates a direct association between the driver and its related forms, fonts, strings and images. Same File, Resources. This method embeds the binary into the EXE portion of the file as a resource with the resource type "HII" (see the LoadImage()). When LoadImage() runs, it looks for the resource and, if its is found, installs a protocol on image's handle with the GUID EFI_HII_PACKAGE_LIST_PROTOCOL_GUID that contains a pointer to the package list. A driver uses HandleProtocol on its own image handle to find a pointer. This has an advantage over the previous methods in that it does not require a UEFI PI image or the firmware file system. So therefore it is suitable for pure UEFI drivers or drivers that are loaded from a plug-in card's option ROM. After finding the resources, the driver simply passes a pointer to the package list into NewPackageList(). Next time we'll look in greater detail at the different types of packages, starting with the strings. Several news sources have posted coverage of IDF 2009, where Phoenix (that's who I work for) booting a UEFI-based system in 1+ seconds and Windows 7 in 7-10 seconds. You can read about it (for example) here. 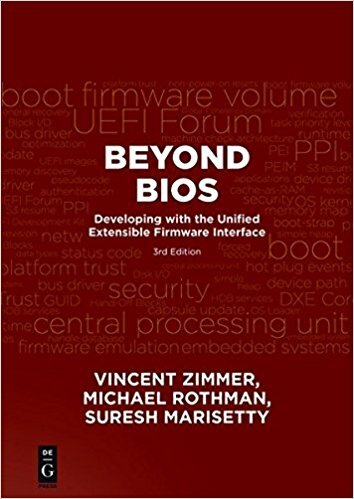 Hey, just a plug for a book that I co-wrote with three other UEFI experts (Mike Rothman, Vincent Zimmer and Bob Hale) about the UEFI Shell. You can read an excerpt from the book on the Intel Press web site here.